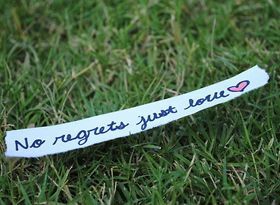 We shouldn't have regret, rather we should be happy that we found one way that doesn't work. Be conscious of your Actions do not live with regrets. Live life to the fullest and make the most of every opportunity that comes your way, so that you don't have any regrets about anything in life. In Life we make choices and decisions that will alter the present and the future. Having little regret is the key to moving on with the situation. Live your life with a positive attitude, never regret failure, continue to learn and help others without expectation. Living life is all about doing what you love and having no regrets for the past. Do all that you love, have no regrets and live life the way you want. The world does not feed you and nor does it place food on your dinner table. have faith in your self and believe that you can do anything, but always be happy and love all that love you and always smile as a smile goes a long way, have faith and trust in your self. Never regret the things that make you smile. Introspection is the element to spiritual growth. I no longer have the same regrets, I've learned the value of the present. Appreciate and value your presence upon the earth .